SepCon Spin Vials are for research use only and not for use in diagnostic of clinical applications. Remove SepCon vial from supplied microcentrifuge tube and pipette sample solution (20-500 µL) into upper portion of vial. 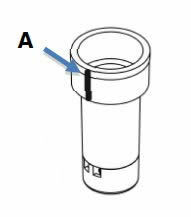 Place SepCon vial in microcentrifuge tube and align the vial's ridge with cap (A). Place microcentrifuge tube in rotor with the vial's ridge pointed to the center of the rotor. Operate centrifuge at up to 600 x g for 20 minutes or until the sample has cleared the upper portion of the vial. Pipette a sufficient volume of the desired elution buffer into the upper portion of the vial; for example, 100-200 µL. Note: Optionally wash the membrane bound material with a suitable buffer by repeating the separation protocol above. To recover material from the membrane surface, pipette the elution buffer carefully and successively across the membrane. Holding the SepCon vial and using tweezers or similar implement, apply pressure on the lower cap part to force it to separate from the upper vial part. Once the cap and vial are separated, carefully recover the filter from the inside of the cap with flat-sided tweezers. Transfer the filter to a microscope slide or other substrate for further analysis. Note: If imaging with short working distance lenses, then remove the square silicone gasket from the filter. Proteins and high concentrations of unconjugated polymers may cause clogging of SepCon spin vials. 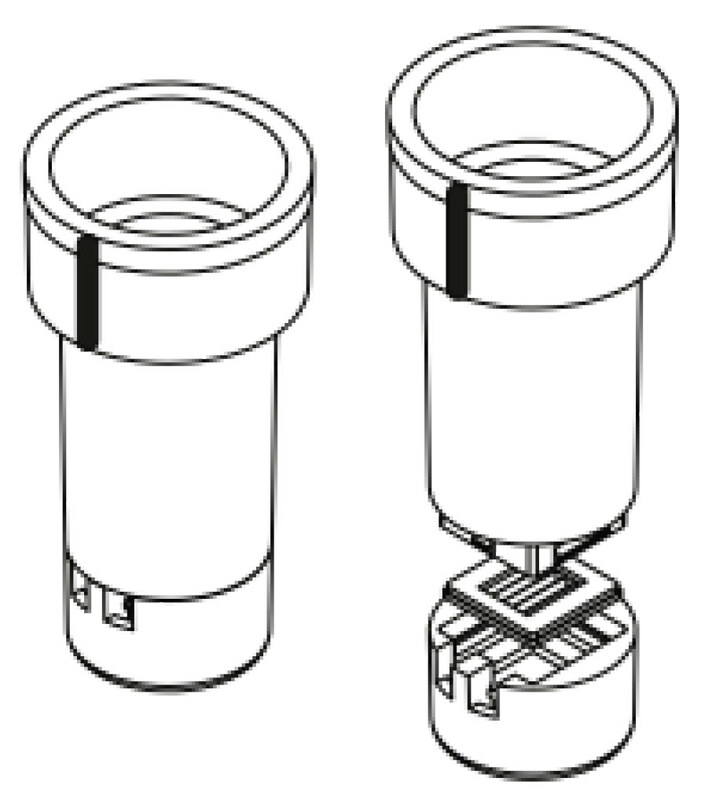 SepCon spin vials are designed for nanoparticles ONLY. Do not allow membrane to fully dry once wet. Do not vigorously pipette against the surface of the membrane. Larger nanoparticles may sediment and clog the membranes at high G-forces. Re-suspend particles and use a lower speed for longer time if sedimentation occurs. Pipette remaining sample solution up and down gently on top of the membrane to disrupt 'cake' formation. If flow rates do not improve, reduce starting solution concentration. Alternatively, add a volume of fresh buffer, gently re-suspend any material on the membrane, and then continue with centrifugation. 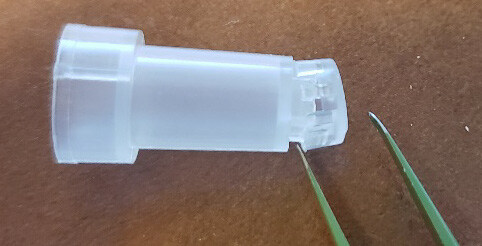 Filtered sample solution below the membrane (15 µL) can be recovered by rotating the SepCon vial in the rotor so the ridge points away from the center and spinning for <1 minute at 200 x g.
SepCon Spin Vials are fabricated and packaged under clean conditions, but are not guaranteed sterile. SepCon spin vials can be sterilized by steam autoclaving, ethylene oxide, hydrogen peroxide, isopropanol or ethanol solutions. Do not sterilize with sodium hydroxide (NaOH). The membranes are made of nanoporous silicon nitride (NPN), which is significantly more stable than conventional polymeric membranes in most acids, alcohols and solvents. Avoid prolonged exposure to significantly basic solutions (>10.0 pH) as membrane damage may occur. While NPN is stable against most solvents, the polyethylene vial and polypropylene microcentrifuge tube may not be suitable for prolonged exposure. Reference a compatibility database prior to use. SepCon spin vials should be stored at room temperature in a clean and dry location and used within 1 year from ship date.